Cosmetology is a profession that continues to grow across not only the country, but also the entire world. More and more women and men are enrolling in beauty school to obtain their certification so they can work in salons, spas, hairdressers, and many other places. 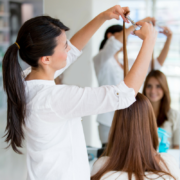 A career in cosmetology can help you build confidence, excitement, and can be very lucrative. Cosmetology school is not easy. You will need to put a lot of hard work and effort into learning different techniques and how to deal with different personalities. Here’s how to determine if beauty school is the right move for you. Can I Really Do Hair for the Rest of My Career? You need to determine if you can do hair for the rest of your career before enrolling in beauty school. If you are excited about working your own schedule, making a great living, working wherever you want, being your own boss and having freedom, then going to cosmetology school might be a good idea for you. Is There Creativity Flowing Through My Veins? Let’s put this right out there: if you answer no to this question then beauty school likely isn’t the best option for you right now. You should have some sort of creativity in you if you want to enroll in beauty school, which is the perfect place for you to hone your creativity, improve it, and expand it. Can I Deal with People? Do you have trouble dealing with people? Do you dread interacting with others when you go to work? Do you hate making small talk? If you answered yes to these questions, beauty school is likely not the best option for you. When you work as a hairdresser or stylist, you will be interacting with people regularly. It’s the main part of your job. You really need to be a people person if you want to enroll in beauty school. At Preston’s Beauty Academy, we also promote management skills in addition to your beauty academy license. Can I Afford Beauty School? Even if you’ve hit all the marks so far, you can only truly attend beauty school if you have the money to pay for it. Cosmetology school is just like going to college. You need to have the funds to do so. There are payment plans available, but these plans won’t make your education free. Aside from tuition, you will need money to pay for other things while in school, including equipment. Be sure to take a look at your finances prior to enrolling so you don’t find yourself broke midway through school and having to drop out and find other work. Going to cosmetology school takes time. You cannot complete the courses in just a matter of weeks. You need to take a look at your schedule and determine if this is the right time. Are you pregnant? Are you getting married? Do you have a trip planned? If you answered yes to any of these questions, you might want to postpone enrolling in beauty school until you have more time to commit. As you can see, there’s plenty of questions you need to ask yourself and answer honestly before determining if beauty school is right for you. Ready to jumpstart your career? Contact Preston’s Beauty Academy today to learn more! http://www.prestonsbeautyacademy.org/wp-content/uploads/2018/02/Untitled-design-5.png 800 800 admin http://www.prestonsbeautyacademy.org/wp-content/uploads/2017/04/Preston-Logo-2.png admin2018-02-23 09:00:462019-02-04 15:25:06Is Beauty School Right for You?